Ellen Mitchell: [first encounter and public appearance] Don't you have anything else you want to say to me? Dave: Thank you for doing this, Ellen. Ellen Mitchell: Go to hell, Bill! Bob Alexander, Alan Reed: YES! An escapist fantasy film, where a Walter Mitty style dream of suddenly being given the chance and the means to heroically make the world a better place for everyone is explored. When an ordinary every-man look-alike to the president is asked to briefly pose as the chief executive, he reluctantly agrees to the put-on. Things get complicated because the real president suffers a debilitating stroke, and the poser is asked to maintain the deception for national security reasons by a corrupt power mongering chief-of-staff. 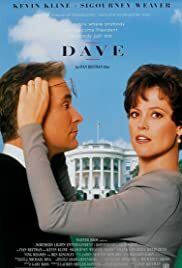 Kevin Kline does an excellent job as the innocent who finds he is a modern day Mr. Smith going to Washington, encountering scandals and corruption going on at these levels. The shadow-government conspiracy theory is nothing new, but this film utilizes the idea with an optimistic viewpoint, since the lead character chooses to effect positive changes, rather than exploit the situation. Corruption is seen as the exception rather than the rule, and that honest people can remove this blight from the landscape, if only they had the bravery to do so. Certainly this is a wildly idealistic premise, but it works. Political insiders are the baddies, the rest of us are the good guys, represented by Dave (a great acting performance by Kevin Kline). Ben Kingsley is great as the sincere and benevolent vice president. Sigourney Weaver is wonderful as the ignored first lady who keys into the deception, and Frank Langella is well cast as the plotting diabolical foe of democracy, Bob Alexander. There are several standouts in the supporting cast, as well. An entertaining "feel good" movie, certainly worth a watch.